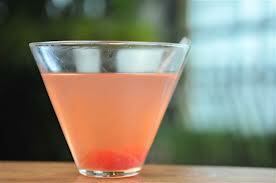 Swedish Berry Martini drink recipe made with Lemon Lime Soda,Banana Liqueur,Cranberry juice,Raspberry Liqueur,Vodka,. How to make a Swedish Berry Martini with all the instructions and ingredients. Fill shaker with ice and add alcoholic ingredients. Fill the rest with half juice and half 7up. Shake until the shaker is too cold to handle. Strain into chilled martini glass. It tastes exactly like the candy. Banana Cosmopolitan View This Recipe! You must specify what size of jigger you are using. We used the large jigger and I think this was meant for a small size.